If this book were a movie, it would be Armageddon, that Bruce Willis action movie from the late-1990s. Armageddon is one of those "summer blockbusters" that are high on intensity but low on plausibility. Really, some oil rig guys are going to drill on the surface of an asteroid and save the earth? Yeah, right. But I loved that movie all the same. I didn't believe it at all, but it sure was fun to watch. Genesis Girl is like that for me. I did not buy the premise at all, but once I let that go, I found myself turning the pages quickly. SUMMARY: Eighteen-year old Blanca has no digital footprint at all. This makes her and her fellow Tabula Rasa graduates especially valuable to corporations interested in advertising with a fresh-faced vestal. At graduation, while the graduates are generally purchased by corporations, Blanca is purchased by an individual. The man, Cal McNeal, wants Blanca to help him with a special project involving his 20-year old son, Seth. 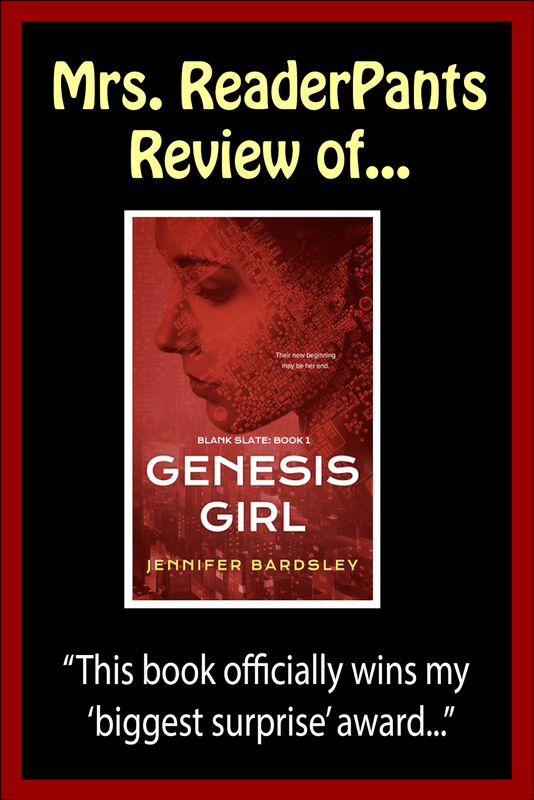 REVIEW: This book officially wins my "biggest surprise" award. 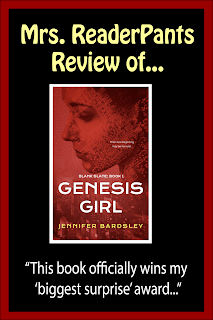 When I received Genesis Girl for review from SLJ, I really wasn't looking forward to reading it. I put off reading it in favor of other titles I was more interested in. When I finally started it, at about 30% into the story, I was seriously struggling to keep going. I just did not buy the premise--why would a corporation find someone without a digital footprint valuable? What corporation values digital virginity over acting talent for making commercials? It is well-known that the graduates are purchased at auction. Where are the civil rights activists protesting the fact that these kids are slaves? But I made myself keep going, and I am so glad I did. No, this book is not perfect. There are major flaws in plausibility, and Blanca is about as infuriating a character as I've seen. The problems between Seth and his father seem like they could have been worked out easily without Blanca's help. But...I really cannot argue that the story is interesting. It's fast-paced, and I honestly wanted to know what was going to happen next. By about halfway through, I stopped noticing what page I was on and really got into the story. The idea that cell phones cause brain cancer is also an interesting one, and I do like how the book addresses digital addiction. I know I am addicted to my phone and laptop. I can't remember the last time I was tech-free for an entire day. It's probably been years. I loved the way characters have "chips" in their fingers that enable them to type and post online in thin air instantly. Sort of like in Minority Report (the movie). I wouldn't be surprised if that actually happens in the future. I do think this will be difficult to booktalk. It's hard to summarize without a lot of explanation. I have read an enormous number of teen dystopia books, and over time, I have become quite critical of plausibility. The best books are able to make me believe the unbelievable. This one unfortunately did not do that, but I enjoyed the ride all the same. THE BOTTOM LINE: Don't believe the story? Just go with it and enjoy the ride. STATUS IN MY LIBRARY: I'm not sure if I'll get this. There are many better dystopias, but digital addiction will definitely speak to my students. Violence: high--a man gets shot, hostage held at gunpoint, person's head bashed in by garden hoe, torture via starvation, references to past "whippings"